Subaru was an early entrant into the SUV market with its Forester back in 1997, but it’s only in recent years that sales of this type of vehicle have soared out of all proportion. Stealing a march on other manufacturers has paid off, and enabled the Japanese car maker to hone the Forester into the very competent all round vehicle it is today. 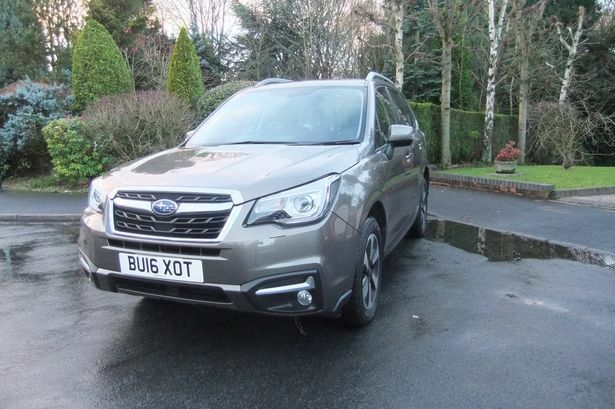 It’s easy to think of a Forester as a model which is aimed just at people who need its off-road, all-wheel-drive ability or commendable towing prowess but this is a car which has so much more. For starters it’s more spacious than your average family hatchback, boasts more luggage space – up to 1,592 litres with the rear seats folded down – and has such a high stance that all round vision is excellent. It might be rugged on the outside but inside it’s a car which cossets the occupants. There is space to really stretch out and the ride is superb. Equipment levels are high and standard features include heated front seats, satellite navigation, a rear view camera, keyless entry and slide and tilt glass sunroof. Because of its height you might expect some body roll but with the Forester that’s not the case, thanks in part to the low centre of gravity of the vehicle created by the flat four engine. This also ensures impressive road holding and sure footedness. At high speed on the motorway it always feels well planted and stable, unlike a lot of SUVs. And with the 2.0-litre, 147bhp Boxer diesel engine under the bonnet linked to the Lineartronic CVT transmission it’s no slouch, hitting 62 miles per hour in 9.9 seconds on its way to a top speed of 117mph. The latest Forester has undergone an upgrade with changes to the front grille, bumper and headlamps as well as the rear lights and alloy wheels. And there has been a big move to make the car even quieter by fitting thicker windows and using more sound proofing material and more sound absorbent seals, the end result of which is a much more refined car which is relaxing to drive. Combine this quieter interior with a four-cylinder engine which is as smooth as a six-cylinder and you have a car which is a pleasure to drive. As part of the upgrade for 2016 the car has been fitted with Steering Responsive Headlights, which means headlamps which rotate left or right into corners as you turn the wheel so you can see exactly what you are driving into. The Forester’s four-wheel-drive system gives it excellent off-road ability and cars with CVT automatic gearboxes – like the one tested – also get X-Mode which adds Hill Decent Control to ensure you don’t go into a slide on off-road downhill sections. The super smooth CVT gearbox also means you can drive this car manually with paddles behind the steering wheel which give it a choice of seven forward gears. The latest Forester has a lot to commend it. It looks good – although it has to be said that it doesn’t have the sleekest of bodies – but when you get behind the wheel it’s a very impressive beast in terms of comfort, performance, space and flexibility. Mechanical: 1998cc, 147bhp, 4 cyl diesel engine driving all wheels via CVT automatic gearbox.